The launch of The BSB Marine A60 Damper has been designed for all marine applications for both bulkhead and deck installations meeting the latest Marine Directive 2014/90/EU and extends the BSB damper range. 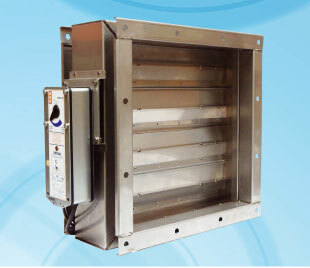 Available with a choice of galvanised or 316 grade stainless steel material specification and thickness, flanged rectangular and circular and multiple assembly dampers, supplied with either 24 volt or 230 volt spring return actuators. Fail-safe closure can be by direct intervention from the fire alarm system, manual operation or the provided fail safe thermal fuse. The BSB Damper Control and Indication Unit provides damper status, healthy and fault status, push button manual operation, fire alarm interface and BMS interface any fault reported. The remote mimic unit option allows dual operation without conflict and allows control and indication either side of the damper install or at a remote station where global systems status is an important requirement. This feature is an asset for fire drills, system operation checks and real time emergencies. For product application, technical and availability please contact our sales team on 01795 422609.